have been sequenced. Although all samples were obtained from individuals residing in Uzbekistan, individuals with direct ancestry from neighboring Central Asian countries are included. Individuals of Uzbek ancestry represent five distinct geographic regions of Uzbekistan: Fergana, Karakalpakstan, Khorezm, Qashkadarya, and Tashkent. Individuals with direct ancestry in nearby countries originate from Kazakhstan, Kyrgyzstan, Russia, Afghanistan, Turkmenistan, and Tajikistan. Our data reinforce the evidence of distinct clinal patterns that have been described among Central Asian populations with classical, mtDNA, and Y-chromosomal markers. Our data also reveal hallmarks of recent demographic events. Despite their current close geographic proximity, the populations with ancestry in neighboring countries show little sign of admixture and retain the primary mtDNA patterns of their source populations. 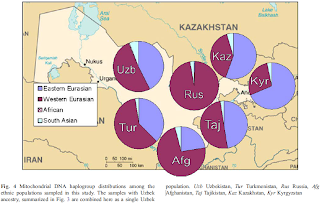 The genetic distances and haplogroup distributions among the ethnic populations are more indicative of a broad east–west cline among their source populations than of their relatively small geographic distances from one another in Uzbekistan. Given the significant mtDNA heterogeneity detected, our results emphasize the need for heightened caution in the forensic interpretation of mtDNA data in regions as historically rich and genetically diverse as Central Asia. It is interesting that only haplogroup Q was found in the (admittedly limited) sample of nomads. I am pretty sure that there is plentiful haplogroup O (the dominant Han group) in the region today and C (the dominant Mongolian one), just as haplogroup R1a which was dominant in the earliest inhabitants of the Tarim basin has lost its special place there. Hopefully we will be seeing more ancient Y chromosome results from the eastern half of the Eurasian continuum in the future. Six human remains (dating ~2500 years ago) were excavated from Pengyang, China, an area occupied by both ancient nomadic and farming people. The funerary objects found with these remains suggested they were nomads. To further confirm their ancestry, we analyzed both the maternal lineages and paternal lineages of the ancient DNA. From the mitochondrial DNA, six haplotypes were identified as three haplogroups: C, D4 and M10. 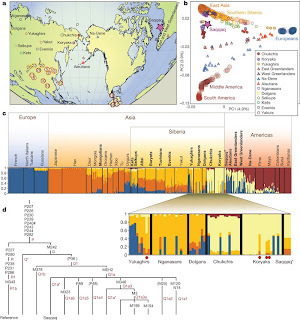 The haplotype-sharing populations and phylogenetic analyses revealed that these individuals were closely associated with the ancient Xiongnu and modern northern Asians. Single-nucleotide polymorphism analysis of Y chromosomes from four male samples that were typed as haplogroup Q indicated that these people had originated in Siberia. These results show that these ancient people from Pengyang present a close genetic affinity to nomadic people, indicating that northern nomads had reached the Central Plain area of China nearly 2500 years ago. Larry David 37% "Native American" and Jessica Alba only 13%? Methinks this is due to inflated Native American DNA estimates, a problem which has plagued this particular test. As far as I know Larry David is Jewish in ancestry, so I would expect a much higher "European" component. Alba is apparently half white Canadian and half Mexican American. A figure of about 1/3 Amerindian ancestry has been estimated for a sample of US Hispanics from New Mexico which would seem consistent with Alba's estimated ancestry estimate. All in all, I would say that these results tend to confirm that while the AncestryByDNA test tends to provide reasonable admixture estimates (within its statistical limitations) for actual admixed persons, it is less valuable for non-admixed individuals who are not a good match for the four chosen ancestral sample groups. Archaeogenetics — Towards a ‘New Synthesis’? NB: All the papers appear to be free to view, so this will be wonderful as a reference. Am J Hum Biol. 2010 Feb 12. Offspring from endogamic vs. exogamic matings: Absence of anthropometric differences among Sardinian children (Italy). Sanna E, De Micco A, Palmas L, Soro MR, Vallascas E, Danubio ME. This study evaluates possible differences in body dimensions among children from matings of different exogamy levels. The cross-sectional sample consisted of 867 children, 435 males, and 432 females, 6-10 years old, attending elementary schools in the metropolitan area of Cagliari, the capital of Sardinia (Italy). The children were divided into two groups according to the level of exogamy. The first group consisted of children of parents born in the same Sardinian municipality and was considered endogamous sensu stricto. The second group included children of parents born in municipalities from different Sardinian linguistic domains and was considered exogamous. The Mann-Whitney test did not reveal significant differences between the two groups of children in the mean rank values of the 36 anthropometric variables considered, with the exception of cephalic circumference in males and chest depth in females. In particular, there were no significant differences for anthropometric variables considered to be indirect indicators of nutritional status: sum of skinfolds, waist/hip ratio, body mass index, total upper arm area, upper arm muscle area, and upper arm fat area. The results indicate that Sardinian children from marriages of different exogamy levels do not differ in body dimensions if they grow up with similar nutritional and socioeconomic conditions. This appears to be a published study by the same team which appeared in a recent National Geographic documentary on the Tarim mummies. The site of Xiaohe (of the current study) is earlier and to the southeast of Urumqi. 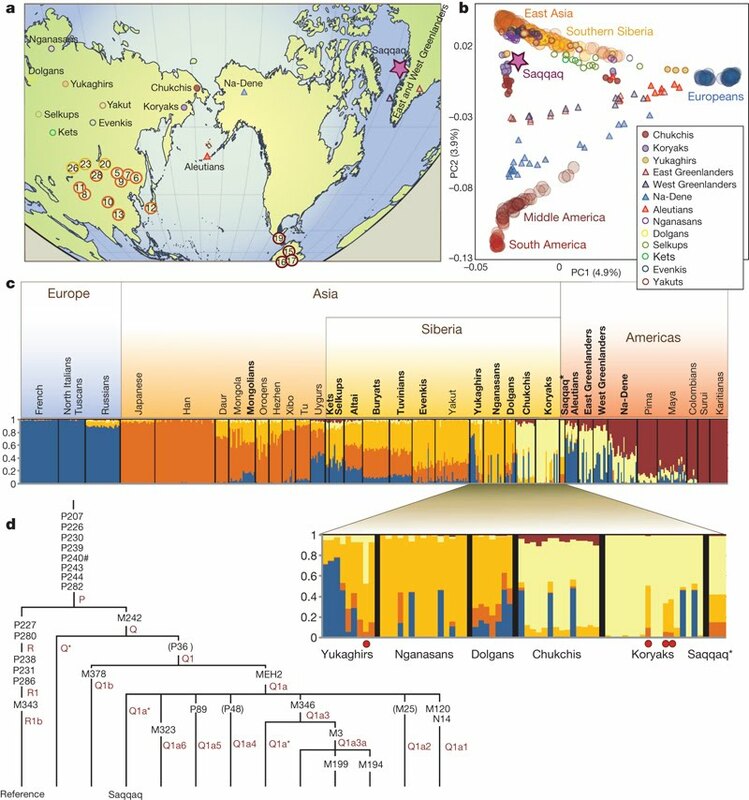 The finding that the Bronze Age population, like that of Krasnoyarsk Siberians belonged exclusively -as far as sampling allows- to Y-chromosome haplogroup R1a1 is extremely interesting as it raises the issue of when and how exactly the diverse extant Y-chromosome gene pool of Central Asia came about. We can now confidently say that even at the early age of ~4ky BP an R1a1-bearing population of presumably western Eurasian origin had acquired a mixed mtDNA gene pool consisting of both west- and east-Eurasian mtDNA, which agrees with what was presented in the aforementioned documentary, in which many of the seemingly Caucasoid mummies had East Eurasian mtDNA. The dominant haplogroup in the Xiaohe people was the East Eurasian lineage C, shared by 14 Xiaohe individuals who were associated with two different mtDNAhaplotypes (S1 and S2). 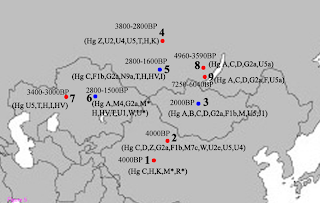 According to the coding region 11969 A to G, all lineage C found in the Xiaohe people were further classified to subhaplogroup C4, which had D-loop group-specific polymorphisms at nucleotide positions (np) 16298 (T to C) and16327 (C to T) . Among the Xiaohe people, three sequences with the unique HVRI motif 16189–16192–16311 formed a subcluster (Figure 2) and were not shared by modern people. [...] The results showed that they are related neither to the West Eurasian haplogroups UK, TJ, HV, R11and R1, nor to the East Eurasian haplogroups B and F. So we designated them as haplogroup R*temporarily. Another sequence with motif 16223–16304, shared by some people fromEast Asia, India, and Europe, was assigned to haplogroup M*. The mtDNA results are interesting because they tie in with my theory of a boreal mtDNA-U zone which has recently found further support (and extended in time) with the mtDNA testing of Kostenki. Like the Krasnoyarsk Siberians the Caucasoid component in Xiaohe is light on U. Unfortunately, we don't have enough information to place the origin of this component in a particular region of West Eurasia. A graphical display of this theory can be seen in Figure 5 from the paper (left). Sites 8, 9 and 3 (Lake Baikal and Xiognu) only have U5 "western" mtDNA, and, as I have argued in my previous post, represent the eastern edge of the "boreal zone" to which were added non-U bearing Caucasoids from the west. The Y chromosome haplogroup of the sevenmales were all assigned to haplogroup R1a1a through screening the Y-SNPs at M89,M9, M45, M173 and M198 successively. Haplogroup R1a1a is widely distributed inEurasia: it is mainly found in Eastern Europe, Central Asia, South Asia, Siberia,ancient Siberia, but rare in East Asia [22-24]. time of this admixture could be much earlier than the time at which the Xiaohe people were living at the site. This means that the time of their mingling was at least a 1000 years earlier than previously proposed. To answer that question, the authors identify Afanasievo and other steppe cultures as related to the Xiaohe people. This is not very surprising as the Afanasievo people were described in the anthropological literature as prominent-nosed Caucasoids of western origin, although individual skulls show Mongoloid influences. So, it's possible that the admixture took place in Siberia, and an already admixed population found its way to Xiaohe by ~4ky BP. The important question is: what happened to the male lineages of the eastern component of this population? 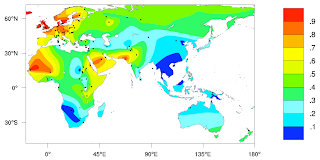 Years ago, I advanced a "pendulum" theory of migrations in Eurasia to explain the fact that quite often we find in the northern belt from Europe to China populations with typically Western/Eastern Y-haplogroups accompanied by the "opposite" (Eastern/Western) mtDNA. According to my thinking, this is due to the patriarchal nature of mobile Eurasian societies (whether nomads or hunters) in which the "clan" maintains its Y-chromosome gene pool but incorporates foreign females. Thus, the absence of non-R1a1 chromosomes can be explained by the fact that non-R1a1 male individuals were not incorporated into the "western" tribe that made its way across Eurasia from Europe to China, but Eastern Eurasian-mtDNA bearing females were gradually absorbed; such would have been plentiful among the indigenous Mongoloid populations that lived east of the Urals since the Paleolithic. Thus, at the eastern end of this migration, we ended up with an R1a1-pure/East Eurasian mtDNA-heavy population. Years later, the pendulum of Eurasian migration swung backwards, with some of the Asian R1a1-bearing individuals returning towards Europe (starting with the Scythians) to meet their distant cousins, this time shedding whatever east Eurasian mtDNA gene pool they had acquired, for the regular west Eurasian mtDNA gene pool that would have been reinforced in the return journey. It's not clear to me how Carthaginians disposed of sacrificial victims, so I'd say that absence of evidence is not evidence of absence. I don't think it's unlikely that the occurrence of child sacrifice may have been "inflated" by hostile observers, but Diodorus Siculus gives a very specific description of what took place there, which I think is unlikely to have been pure invention. 14 Therefore the Carthaginians, believing that the misfortune had come to them from the gods, betook themselves to every manner of supplication of the divine powers; and, because they believed that Heracles, who was worshipped in their mother city,29 was exceedingly angry with them, they sent a large sum of money and many of the most expensive offerings to Tyre. 2 Since they had come as colonists from that city, it had been their custom in the earlier p179period to send to the god a tenth of all that was paid into the public revenue; but later, when they had acquired great wealth and were receiving more considerable revenues, they sent very little indeed, holding the divinity of little account. But turning to repentance because of this misfortune, they bethought them of all the gods of Tyre. 3 They even sent from their temples in supplication the golden shrines with their images,30 believing that they would better appease the wrath of the god if the offerings were sent for the sake of winning forgiveness. 4 They also alleged that Cronus31 had turned against them inasmuch as in former times they had been accustomed to sacrifice to this god the noblest of their sons, but more recently, secretly buying and nurturing children, they had sent these to the sacrifice; and when an investigation was made, some of those who had been sacrificed were discovered to have been supposititious. 5 When they had given thought to these things and saw their enemy encamped before their walls, they were filled with superstitious dread, for they believed that they had neglected the honours of the gods that had been established by their fathers. In their zeal to make amends for their omission, they selected two hundred of the noblest children and sacrificed them publicly; and others who were under suspicion sacrificed themselves voluntarily, in number not less than three hundred. 6 There was in their city a bronze image of Cronus, extending its hands, palms up and sloping toward the ground, so that each of the children when placed p181thereon rolled down and fell into a sort of gaping pit filled with fire. Rogue Classicist also has reservations about the way the story is presented in the media. Jeffrey H. Schwartz et al. Two types of cemeteries occur at Punic Carthage and other Carthaginian settlements: one centrally situated housing the remains of older children through adults, and another at the periphery of the settlement (the “Tophet”) yielding small urns containing the cremated skeletal remains of very young animals and humans, sometimes comingled. Although the absence of the youngest humans at the primary cemeteries is unusual and worthy of discussion, debate has focused on the significance of Tophets, especially at Carthage, as burial grounds for the young. One interpretation, based on two supposed eye-witness reports of large-scale Carthaginian infant sacrifice [Kleitarchos (3rd c. BCE) and Diodorus Siculus (1st c. BCE)], a particular translation of inscriptions on some burial monuments, and the argument that if the animals had been sacrificed so too were the humans, is that Tophets represent burial grounds reserved for sacrificial victims. An alternative hypothesis acknowledges that while the Carthaginians may have occasionally sacrificed humans, as did their contemporaries, the extreme youth of Tophet individuals suggests these cemeteries were not only for the sacrificed, but also for the very young, however they died. Here we present the first rigorous analysis of the largest sample of cremated human skeletal remains (348 burial urns, N = 540 individuals) from the Carthaginian Tophet based on tooth formation, enamel histology, cranial and postcranial metrics, and the potential effects of heat-induced bone shrinkage. Most of the sample fell within the period prenatal to 5-to-6 postnatal months, with a significant presence of prenates. Rather than indicating sacrifice as the agent of death, this age distribution is consistent with modern-day data on perinatal mortality, which at Carthage would also have been exacerbated by numerous diseases common in other major cities, such as Rome and Pompeii. Our diverse approaches to analyzing the cremated human remains from Carthage strongly support the conclusion that Tophets were cemeteries for those who died shortly before or after birth, regardless of the cause. The number of published complete genomes is starting to grow exponentially it seems. Pretty soon, I'm guessing, once most major groups are covered by at least one individual, they will cease to be paper-worthy, and we will move on to the era of full-genome population studies. One of the published individuals is Desmond Tutu, so I am adding this to the Famous DNA label as well. 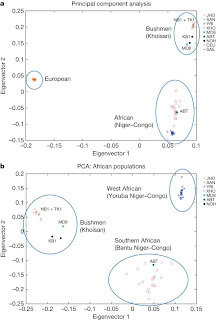 In the 117 megabases (Mb) of sequenced exome-containing intervals, the average rate of nucleotide differences between a pair of the Bushmen was 1.2 per kilobase, compared to an average of 1.0 per kilobase differing between a European and Asian individual. It's striking that two Bushmen are more different from each other than a European and an Asian are. This is in agreement with the idea that Bushmen have a substantial Palaeoafrican genomic component, while Eurasians and most other Africans emerged from a younger population flowering within the species, which I have termed "Afrasian". Eurasians are descended from these (presumably East African "Afrasians"), as are most Africans, but with varying degrees of intermixture with other (non-"Afrasian") groups of humans that lived in the continent from times immemorial at the time of the Out-of-Africa (and "Deeper-into-Africa") expansions. On the right we see some interesting facts for three individuals (Bushman, KB1; Chinese: YH; European-American: J.C. Venter). 2-way sharing between individuals is roughly in the order of ~500. The Bushman has twice as many "private" variation as the Eurasians, consistent with the ancient basal position in the human family. The large number of novel SNPs raises concerns regarding the ability of current genotyping arrays to capture effectively the true extent of genetic diversity and haplotype structure represented in southern Africa. Assessing percentage heterozygosity for 1,105,569 autosomal SNPs using current-content Illumina arrays, we were surprised to find lower heterozygosity in KB1 compared to a region-matched European control (Supplementary Data and Supplementary Fig. 3a, b), because it is well known that genetic diversity is highest in Africa. However, analysis of whole-genome sequencing data for KB1 and ABT revealed high percentages of heterozygous SNPs (59% and 60%, respectively), as expected. This discrepancy underscores the inadequacy of current SNP arrays for analysing southern African populations. This is not very surprising: SNPs used in microarrays have not been discovered in Bushmen, so by testing for heterozygosity in Bushmen using them, you actually underestimate it. By not including Bushmen in the SNP-discovery process you implicitly assume non-variability (hence "no SNP") at sites where Bushmen (but not other humans) are variable. With whole-genome sequencing we are able to see that Bushmen are indeed highly heterozygous. This should serve as a warning for making too much of patterns of heterozygosity from microarray genotype data, even the latest ~1M ones. NB: The paper is freely available to non-subscribers, so you can go ahead and read it in full. The genetic structure of the indigenous hunter-gatherer peoples of southern Africa, the oldest known lineage of modern human, is important for understanding human diversity. Studies based on mitochondrial1 and small sets of nuclear markers2 have shown that these hunter-gatherers, known as Khoisan, San, or Bushmen, are genetically divergent from other humans1, 3. 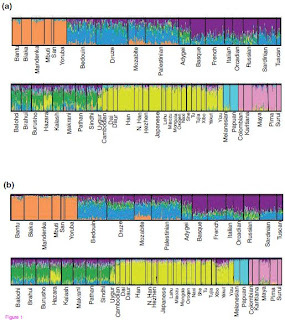 However, until now, fully sequenced human genomes have been limited to recently diverged populations4, 5, 6, 7, 8. Here we present the complete genome sequences of an indigenous hunter-gatherer from the Kalahari Desert and a Bantu from southern Africa, as well as protein-coding regions from an additional three hunter-gatherers from disparate regions of the Kalahari. We characterize the extent of whole-genome and exome diversity among the five men, reporting 1.3 million novel DNA differences genome-wide, including 13,146 novel amino acid variants. 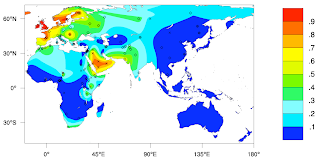 In terms of nucleotide substitutions, the Bushmen seem to be, on average, more different from each other than, for example, a European and an Asian. Observed genomic differences between the hunter-gatherers and others may help to pinpoint genetic adaptations to an agricultural lifestyle. Adding the described variants to current databases will facilitate inclusion of southern Africans in medical research efforts, particularly when family and medical histories can be correlated with genome-wide data. Saint Birgitta (Saint Bridget of Sweden) lived between 1303 and 1373 and was designated one of Europe's six patron saints by the Pope in 1999. According to legend, the skulls of St. Birgitta and her daughter Katarina are maintained in a relic shrine in Vadstena abbey, mid Sweden. The origin of the two skulls was assessed first by analysis of mitochondrial DNA (mtDNA) to confirm a maternal relationship. The results of this analysis displayed several differences between the two individuals, thus supporting an interpretation of the two skulls not being individuals that are maternally related. Because the efficiency of PCR amplification and quantity of DNA suggested a different amount of degradation and possibly a very different age for each of the skulls, an orthogonal procedure, radiocarbon dating, was performed. The radiocarbon dating results suggest an age difference of at least 200 years and neither of the dating results coincides with the period St. Birgitta or her daughter Katarina lived. The relic, thought to originate from St. Birgitta, has an age corresponding to the 13th century (1215–1270 cal AD, 2σ confidence), which is older than expected. Thus, the two different analyses are consistent in questioning the authenticity of either of the human skulls maintained in the Vadstena relic shrine being that of St. Birgitta. Of course there are limitations when interpreting the data of any ancient biological materials and these must be considered for a final decision on the authenticity of the remains. The Greenlander belonged to a Paleo-Eskimo culture called the Saqqaq by archaeologists. On the basis of his genome, the Saqqaq man’s closest living relatives are the Chukchis, people who live at the easternmost tip of Siberia. His ancestors split apart from Chukchis some 5,500 years ago, according to genetic calculations, implying the Saqqaq people’s ancestors must have traveled across the northern edges of North America until they reached Greenland. The Saqqaq man’s genome is so complete that the Danish researchers have been able to reconstruct his probable appearance and susceptibility to disease from the genetic information in his genome. They predict he would have had brown eyes because of variations, at four positions along his DNA, that are associated with brown eye color in East Asians. He has the East Asian version of a gene known as EDAR, which endows people with hair that is thicker than that of most Europeans and Africans. Another gene suggests he would have had dry earwax, as do Asians and Native Americans, not the wet earwax of other ethnic groups. Perhaps reflecting the so far somewhat limited reach of personal genomics, the researchers note that the ancient Greenlander was at risk for baldness, a surprising assessment given that all that remains of him is his hair. Dr. Rasmussen said he assumed the man died young. The importance of this sequence is that it offers us a glimpse into a man who lived before 4,000 years of recent evolution. Obviously we will need to sample more individuals before we can speak about evolutionary change across this time span, and doing so for anyone living in more southernly latitudes where most of humankind have always lived will be tricky. ST. PAUL, Minn. – A Mediterranean diet may help people avoid the small areas of brain damage that can lead to problems with thinking and memory, according to a study released today that will be presented at the American Academy of Neurology's 62nd Annual Meeting in Toronto April 10 to April 17, 2010. "The relationship between this type of brain damage and the Mediterranean diet was comparable with that of high blood pressure," said study author Nikolaos Scarmeas, MD, MSc, of Columbia University Medical Center in New York and a member of the American Academy of Neurology. "In this study, not eating a Mediterranean-like diet had about the same effect on the brain as having high blood pressure." Previous research by Scarmeas and his colleagues showed that a Mediterranean-like diet may be associated with a lower risk of Alzheimer's disease and may lengthen survival in people with Alzheimer's disease. According to the present study, these associations may be partially explained by fewer brain infarcts. Mitochondrial DNA heritage of Cres Islanders--example of Croatian genetic outliers. Jeran N, Havas Augustin D, Grahovac B, Kapović M, Metspalu E, Villems R, Rudan P.
Diversity of mitochondrial DNA (mtDNA) lineages of the Island of Cres was determined by high-resolution phylogenetic analysis on a sample of 119 adult unrelated individuals from eight settlements. The composition of mtDNA pool of this Island population is in contrast with other Croatian and European populations. The analysis revealed the highest frequency of haplogroup U (29.4%) with the predominance of one single lineage of subhaplogroup U2e (20.2%). Haplogroup H is the second most prevalent one with only 27.7%. Other very interesting features of contemporary Island population are extremely low frequency of haplogroup J (only 0.84%), and much higher frequency of haplogroup W (12.6%) comparing to other Croatian and European populations. Especially interesting finding is a strikingly higher frequency of haplogroup N1a (9.24%) presented with African/south Asian branch almost absent in Europeans, while its European sister-branch, proved to be highly prevalent among Neolithic farmers, is present in contemporary Europeans with only 0.2%. Haplotype analysis revealed that only five mtDNA lineages account for almost 50% of maternal genetic heritage of this island and they present supposed founder lineages. All presented findings confirm that genetic drift, especially founder effect, has played significant role in shaping genetic composition of the isolated population of the Island of Cres. Due to presented data contemporary population of Cres Island can be considered as genetic "outlier" among Croatian populations. The frappe analysis for K=7 using ~16k and ~19k X chromosome (top) and Chromosome 16 (bottom) SNPs is shown. The pattern is almost identical. This showcases the fallacy of a common objection to the concept of "race", namely that it is "trait-specific" and by looking at one trait (or locus) we will arrive at one racial classification, while looking at another wew will arrive at another. The fact that by looking at two completely independently inherited pieces of DNA we arrive at the same conclusion is strong visual evidence that race is neither (a) a subjective property which depends on which part of the genome we look at, nor (b) a holistic property that can only be inferred by looking at the individual in toto. Amanda M Casto et al. The transmission pattern of the human X chromosome reduces its population size relative to the autosomes, subjects it to disproportionate influence by female demography, and leaves X-linked mutations exposed to selection in males. As a result, the analysis of X-linked genomic variation can provide insights into the influence of demography and selection on the human genome. Here we characterize the genomic variation represented by 16,297 X-linked SNPs genotyped in the CEPH human genome diversity project samples. We found that X chromosomes tend to be more differentiated between human populations than autosomes with several notable exceptions. Comparisons between genetically distant populations also showed an excess of X-linked SNPs with large allele frequency differences. Combining information about these SNPs with results from tests designed to detect selective sweeps, we identified two regions that were clear outliers from the rest of the X chromosome for haplotype structure and allele frequency distribution. We were also able to more precisely define the geographical extent of some previously described X-linked selective sweeps. The relationship between male and female demographic histories is likely to be complex as evidence supporting different conclusions can be found in the same dataset. Although demography may have contributed to the excess of SNPs with large allele frequency differences observed on the X chromosome, we believe that selection is at least partially responsible. Finally, our results reveal the geographical complexities of selective sweeps on the X chromosome and argue for the use of diverse populations in studies of selection.